Could repairs of deteriorating subway structures (2/3, Q/B) bordering the Atlantic Yards site cost tens of millions of dollars and delay subway service? Perhaps. A confidential December 2007 report commissioned by developer Forest City Ratner and provided to the Metropolitan Transportation Authority (MTA) stated that portions of two tunnels were in critical condition and required repair "in the immediate future" and the "near future." 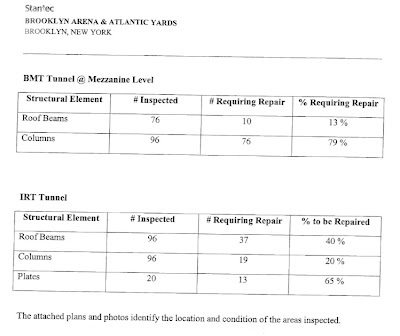 Preliminary remedial work has been performed--the MTA won't say how much--but further repairs on these tunnels are not part of the MTA's recently-released draft Capital Plan, which covers 2010-14 and aims to address only some of the system's many needs. In other words, should the Atlantic Yards arena open in 2011-12 as currently projected, it may be bordered by seriously deteriorated subway structures. We don't know whether the city or Forest City Ratner have asked for accelerated repairs or stated a willingness to pay for them. 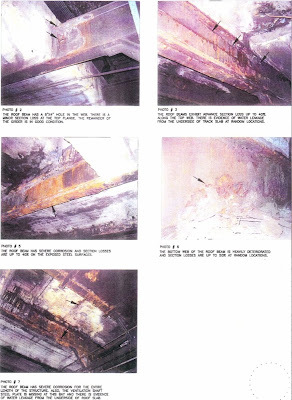 In the photos above right, for example, the roof beam at top "has severe corrosion and section loss is up to 40% at bottom flange" and the roof beam below "has severe corrosion and section loss is up to 30% at bottom flange." Both are part of the platform ceiling plan for the B/Q trains as they pass well below the western tip of the main Atlantic Yards site, between the intersections of Atlantic and Flatbush avenues. The issue of deteriorating subway structures has received a lot more attention in the past ten days, after a 35-foot section of ceiling collapsed August 16 at the 181st Street station; the falling rubble did not cause injuries. Three more stations along the 1 line were closed last night for emergency ceiling inspections. 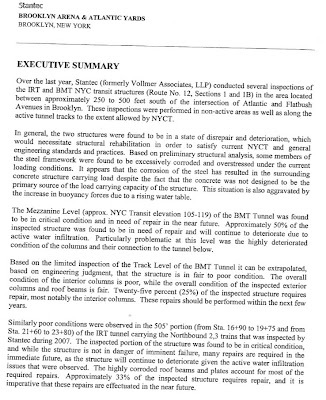 The report on subway structures near the Atlantic Terminal transit hub does not cover ceilings but rather exterior and interior columns, roof beams, and steel plates. For example, the graphic at left cites (via filled-in black circles) several heavily corroded steel columns in the platform ceiling of the B/Q, just east of the intersection of Atlantic and Flatbush avenues and near the projected site for the Urban Room. The photos above--#5 and #9--are indicated on the map at left. 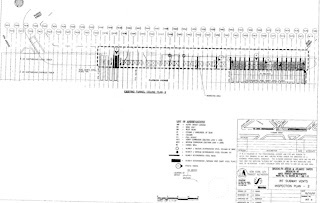 The graphic at right below shows (via thick black bars) several heavily deteriorated steel beams in the tunnel ceiling plan of the 2/3 trains running west along Flatbush Avenue between Dean Street and the Pacific Street/Fifth Avenue intersection. This borders the arena block. 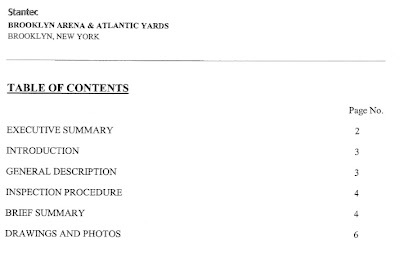 There's no proof that work on the Atlantic Yards site directly threatens the subway system, but Forest City Ratner wouldn't have had the report prepared were there no reason for concern. I filed a Freedom of Information Law (FOIL) request for documents explaining remedial actions taken, and was told that "this matter is in the negotiation stage and no contract has been awarded as yet." Thus my "request is premature as all documents (if any exist) up to this point would be intra-agency non-final proprietary documents which are not disclosable under FOIL." I followed up with the MTA public affairs office. 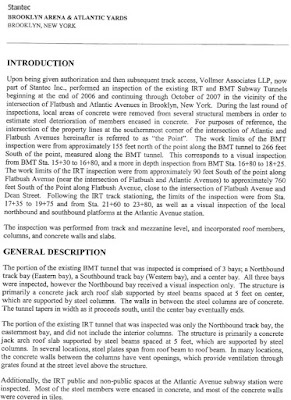 "New York City Transit is aware of the condition of the BMT and IRT tunnels near the Atlantic Yards site. Engineers regularly inspect these tunnels and will continue to do so," MTA spokesman Aaron Donovan responded. "They have found conditions that are typical of a situation in which water infiltrates the subway system." At left, for example, the Stantec report showed (clockwise from top left), a roof beam with a hole; roof beams with "advance section loss up to 40%"; a "heavily deteriorated" bottom web of the roof beam; a roof beam with "severe corrosion"; and a roof beam with "severe corrosion and section losses are up to 40% on the exposed steel surfaces." The numbers on the photos correspond to the notations on the graphic above. "In response to those inspections, New York City Transit maintenance crews have made steel repairs and have done chemical grouting to divert water," Donovan said. How extensive were the repairs and grouting? I several times requested details, but Donovan was unable to provide them. So we don't know how much the critical conditions have been resolved. "These remedial actions, which are funded by the New York City Transit operating budget, will continue as necessary to ensure the continued safe operation of these tunnels," he added. Donovan indicated that the Stantec report--which I received from an anonymous source--was no surprise: "The issuance of the December 2007 report from outside engineers has not caused work plans to be adjusted. Based on their own inspections, New York City Transit maintenance engineers submitted a profile for a capital rehabilitation project that would remedy these conditions for the long term." When might such work be done? "Such a project, which would involve temporary subway service disruptions, has not been included in the draft proposed 2010-2014 Capital Plan," Donovan said. "There are numerous repair and reconstruction needs in the subway system, and areas exhibiting worse conditions need to be prioritized. Although not included in the capital plan at this time, projects can always be reprioritized within the Capital Program should it become necessary." The proposed Capital Plan (see p. 42 of this PDF) includes $521 million for line structure rehabilitation, painting, and enhancements. Service disruptions after arena opens? Still, unclear is the extent of potential service disruptions and how they might affect the transit hub at Atlantic Avenue/Pacific Street should the Atlantic Yards arena open. Right now the best-case scenario for an arena opening is 2012, which would be well before the 2014 date of the next capital plan. Note that, as Times columnist Jim Dwyer pointed out last week, Mayor Mike Bloomberg's priority has not been maintenance but the extension of the 7 line. I'd add that another priority is obviously the Atlantic Yards project, given that mayoral appointees took the lead on the revision of the MTA's deal for the Vanderbilt Yard. Over the last year, Stantec (formerly Vollmer Associates, LLP) conducted several inspections of the IRT and BMT NYC transit structures (Route No. 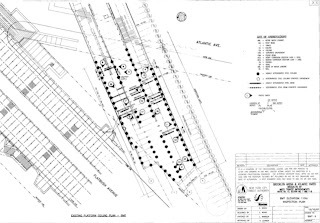 12, Sections 1 and 1B) in the area located between approximately 250 to 500 feet south of the intersection of Atlantic and Flatbush Avenues in Brooklyn. These inspections were performed in non-active areas as well as along the active tunnel tracks to the extent allowed by NYCT. In general, the two structures were found to be in a state of disrepair and deterioration, which would necessitate structural rehabilitation in order to satisfy current NYCT and general engineering standards and practices. Based on preliminary structural analysis, some members of the steel framework were found to be excessively corroded and overstressed under the current loading conditions. It appears that the corrosion of the steel has resulted in the surrounding concrete structure carrying load despite the fact that the concrete was not designed to be the primary source of the load carrying capacity of the structure. This situation is also aggravated by the increase in buoyancy forces due to a rising water table. The Mezzanine Level (approx. 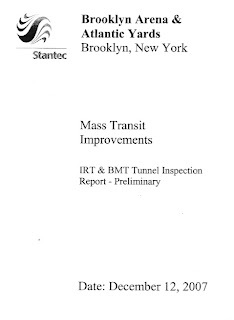 NYC Transit elevation 105-119) of the BMT Tunnel was found to be in critical condition and in need of repair in the near future. Approximately 50% of the inspected structure was found to be in need of repair and will continue to deteriorate due to active water infiltration. Particularly problematic at this level was the highly deteriorated condition of the columns and their connection to the tunnel below. Based on the limited inspection of the Track Level of the BMT Tunnel it can be extrapolated, based on engineering judgment, that the structure is in fair to poor condition. The overall condition of the interior columns is poor, while the overall condition of the inspected exterior columns and roof beams is fair. Twenty-five percent (25%) of the inspected structure requires repair, most notably the interior columns. These repairs should be performed within the next few years. 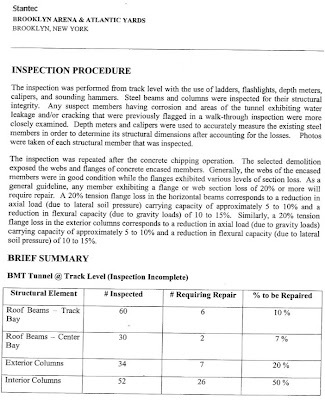 Similarly poor conditions were observed in the 505' portion ... of the IRT tunnel carrying the Northbound 2,3 trains that was inspected by Stantec during 2007. 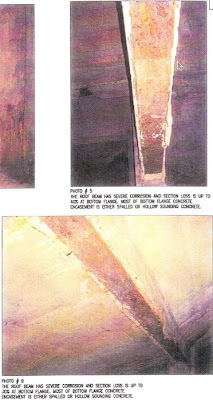 The inspected portion of the structure was found to be in critical condition and while the structure is not in danger of imminent failure, many repairs are required in the immediate future, as the structure will continue to deteriorate given the active water infiltration issues that were observed. The highly corroded roof beams and plates account for most of the required repairs. Approximately 33% of the inspected structure requires repair, and it is imperative that these repairs are effectuated in the near future.